Let's talk holiday decor. I get really excited about the idea of decorating our home for the holidays...yet I'm apprehensive to use the typical "old fashioned" decorations I've got locked up in the garage. They seem a little dated and I'm always on the hunt for something fresh and new. 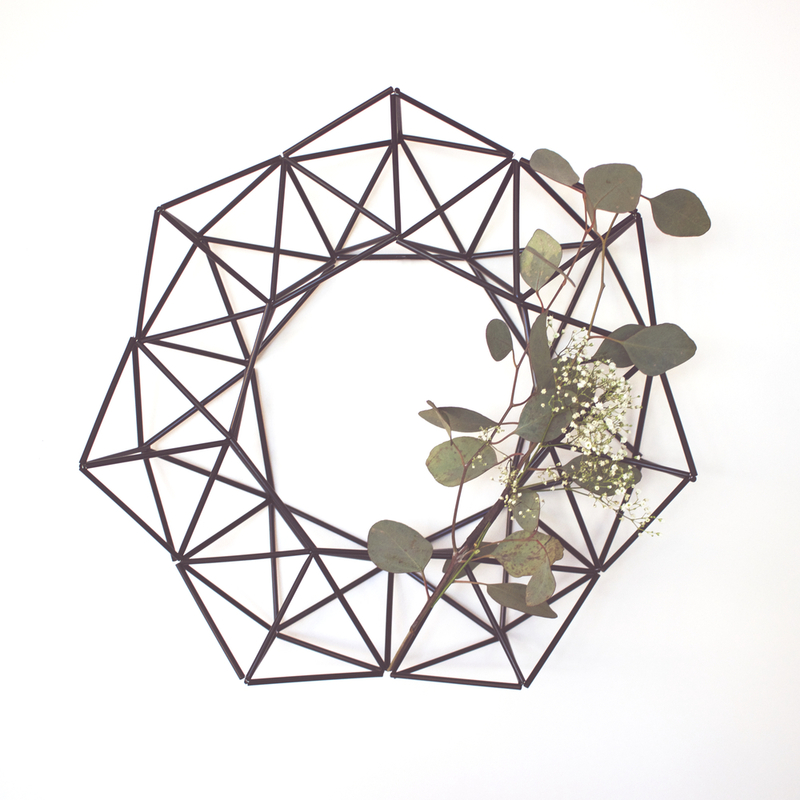 This magical geometric wreath appeared in the form of a pin and I got really excited. It's versatile, easy to make, and I've already styled it for Halloween, Thanksgiving and now...Christmas. We loved it so much that we had a workshop for it! It was so much fun. We shared a few laughs over delicious mimosas, an assortment of cookies and hosted some lovely ladies. It was fun getting to know our instagram shop followers. What a fun way to spend a Saturday afternoon. We made the wreaths and then decorated them with sprigs of eucalyptus and baby's breath. 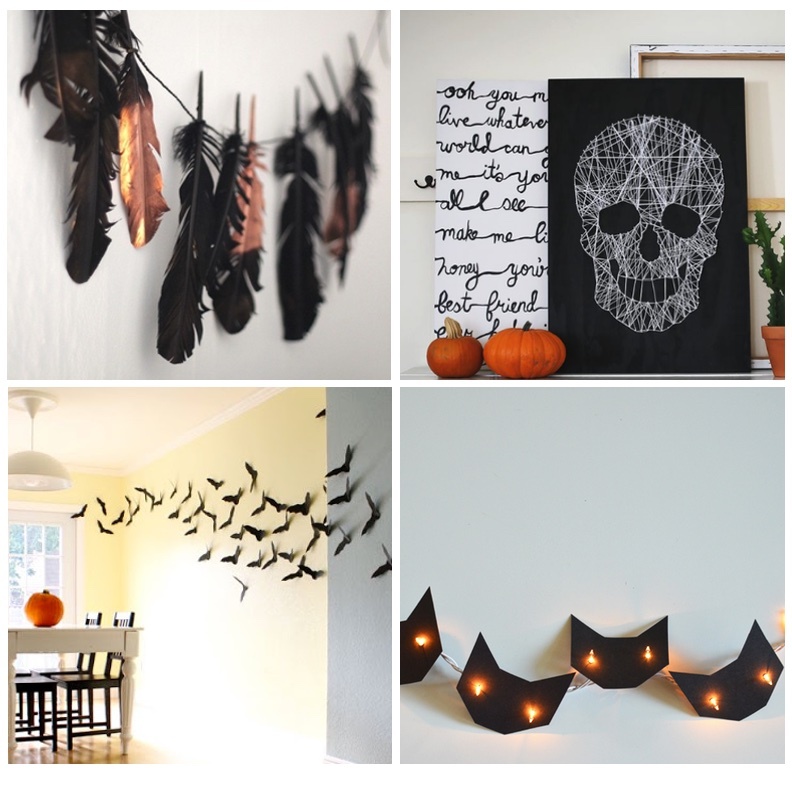 What we're coveting for Halloween Decor! It's mid-October and Halloween is nearly here! This weekend, we will be decorating the studio to get ready for all of the trick or treat fun. Below are ideas we found around the web (pun intended) that we love. They are modern and clean but still have the fun, spooky vibe of Halloween. I love the black, white, and gold with hints of orange. And all of these painted pumpkins are making me throw out the mess that is carving. How cute are these?! Thrifting is one of those designer duties you have to wear your party pants for. You've got your regular stores, you zip into the parking lot, throw it into park, walk in...take a look at the questionable items (and people) and leave. You leave happy or unenthused. Most of the time, unenthused. This weekend I left with a smile that could have scared small children. I came across this $12 Hollywood Regency brass vanity bench and did a solo party dance in the back of the antique market. Later that day, I picked up new piece of foam at Joanne's (because who knows what kind of crust lived deep within that existing cushion) and I got to work. I hoard tons of fabric for various projects from all over the globe and this vintage indigo number ended up working beautifully for the end product. I hope you love the transformation. The monstrosity of restraint I've developed as an Interior Designer is MUCH more powerful than my husband believes it to be. I'm constantly surrounded by beautiful home decor and purchasing for clients isn't as exhilarating as it seems, when you're not taking it home for yourself. My coping mechanism? DIY projects that resemble things you see and want that are insanely expensive. This intro rant brings you to my first DIY here on lè blog, Indigo Dyed Napkins, Shibori style. Shibori is a Japanese textile art & technique dated back to the 8th century. It's beautiful, unique and authentic. Just give Pinterest a few more months and we'll all be Shibori'd to death, but that won't stop me from making napkins, dishtowels and fabric out of it, will it! I had a few old West Elm cotton napkins that I wasn't using anymore and decided to give them new life. Once my Indigo Tie Dye kit arrived, I found that it yields 5 pounds of dyed fabric that I couldn't stand to waste. So, I went ahead, re-charged my spendorphins and bought two yards of white cotton fabric, some white feathers AND a stack of white dish towels so I use them as housewarming gifts. Not the feathers, more on that later. This shopping technique is also referred to as hoarding. If you have a backyard where you can hang a clothesline, I highly recommend doing this depending on the amount of fabric you plan on dying. I hung a twenty foot clothesline across my backyard to account for my hoards before I got started. Also, you'll need a huge bucket with a lid, to keep oxygen from freely flowing around and into your dye. Time to start mixing - make sure you follow the instructions that come along in the box. Once you're done doing a little mixy dance, put a lid on it and step away for about 30 minutes. When you come back, it will look like this. While that was busy "cooking", I was busy wrapping all my fabrics and getting them ready to be dipped. I used Pinterest as a resource for various Shibori techniques. I spent a good 35 minutes twisting and prepping my fabrics. When you're done with your twisting party, dunk them in the sink for a few minutes and make sure they're soaked before the dying process starts. It should all look something like this. Now, you can choose to let them air dry like this for a while OR if you lack patience like me, you can unwrap them after ten minutes and hang them dry to oxidize quicker. If you choose the path of less patience, it will look like this. These make such great gifts. I've already wrapped two up for a sweet housewarming gift!